A bushel is a LOT of cucumbers. I came home from work today and set upon the last of them, making 8 quarts of the dill pickles we like (the recipe from the American Family Cookbook). However, I only got 7 quarts.... why? Because I made a stupid mistake. I had too many cukes for a 7 quart batch, and the canner only holds 7 quarts. I made 8 quarts, and figured I'd process 4 quarts at a time. Well, by the time the first batch was done, the second batch had cooled too much, and as the first jar went into the boiling water I heard, "CRACK!" Sure enough, the bottom had cracked right off. I had to toss that jar, dump out the water, clean the pot, and refill it with cool water and the last 3 quarts. They eventually were processed for 10 minutes once I finally got the pot boiling again. While that disaster was occurring, I was multi-tasking. I had been encouraged to m ake half-sours so I decided to try them. 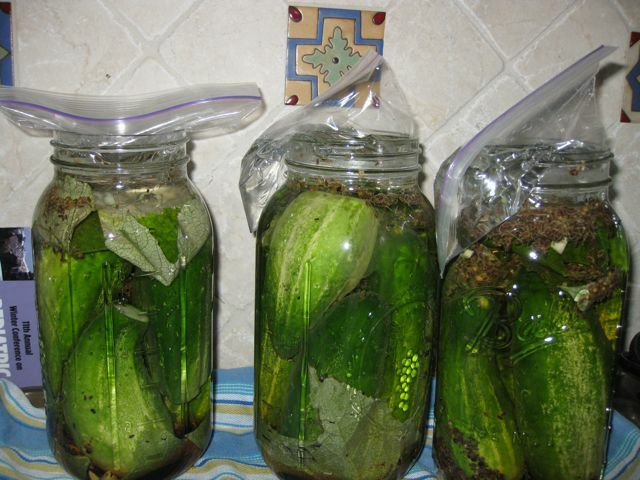 I've been afraid of the fermented-type pickle. It seems like a lot of work and, maybe I'm wrong, there seems to be more ways it could fail. Regardless, I thought the recipe (from The Joy of Pickling) was easy enough and, since they only take a week, I could manage the commitment. 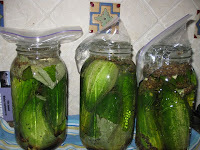 So I got 3 half-gallon jars cleaned in the dishwasher, put in 2 grape leaves, 3 cloves garlic, 1 bay leaf, 1/2 tsp each of peppercorns and coriander (crushed together), and 3 T. dill seed and the cucumbers. To this I added the brine, and topped with ziploc bags filled with brine to act as weights. (The grape leaves are supposed to make the pickles crispy.) Supposedly they'll start fermenting in about 3 days. I'm excited about the half-sours... I think. I would like to know how long the house is going to smell like vinegar. I'll have to google and see what the half sours are....Keep us advised. I was at the farmers market this morning and they had the little cukes 5 to 6 in a bag for a $1.00. Picked them up, got scared and put them down, now I have to do research and then buy them next week. I wonder how long they would last before I can can them? Hi, Jeanine, I don't think they last too long. I bought them on Sunday, and by today, in the fridge, they were a tiny bit soft on one end. I don't think I could have let them sit another day. You should plan on using them within a day, I would think.